How do I transfer my SITE to JujuHost? manage databases and backups, etc. 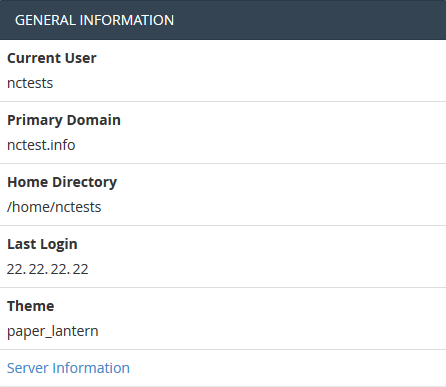 More details about the structure of WHM/cPanel users depending on their permissions can be found in this article. We have cPanel 11.70 installed on our hosting servers. You can find the latest documentation covering all its functions here. You can find cPanel structure overview for cPanel basic style and for cPanel retro style below in this guide. Google Apps: with this tool you will be able to configure Google Apps service for your domain in just a few clicks. Feel free to check this category for more information. Namecheap SSL: this menu allows you to use Namecheap SSL cPanel plugin, check this guide for more details. Website Builder: this tool allows you to easily create an entire website using a drag-and-drop editor and without knowing any code or installing special software. Contact Support: opens a Live Chat with our customer support team. Namecheap Knowledgebase: this button will take you to our Knowledgebase site section. Images: this tool allows you to view and modify images in your account. Directory Privacy: allows you to set a requirement for a username and password when users attempt to access your site from the web. It can be used when you need to limit access to a certain part of your site. You can get more details in this guide. Disk Usage: in this menu you will be able to check a detailed information about the disk space usage of your account. It shows disk usage totals for your account’s directories and all of its databases, not for individual files or databases. More details about Disk Space usage optimization are provided in this article. FTP Connections: using this tool you can monitor the users who are currently logged into your site via FTP. Also, it’s possible to terminate an FTP connection from here. Backup: this feature allows you to download a zipped copy of your entire account or specific parts of it, such as your home directory, databases, email forwarder configuration, or your email filters configuration. More details guidance about how to make backups in cPanel can be found here. Backup Wizard: a user-friendly interface for creating a backup of your entire site, a partial backup, or allowing a site restoration from the last backup saved. Note, that Restore option provided in this menu is disabled by default on all our shared servers. Inodes Usage: provides the statistics of your account inodes (files) usage.You will find more details about this tool here. phpMyAdmin: it’s the database management tool, which allows you to make different changes to MySQL databases in your account. You can find more information about how to work with databases via phpMyAdmin this guide. MySQL Databases: in this menu you can create and manage MySQL databases in cPanel account. You can refer to this guide for more details. MySQL Databases Wizard: provides the same functionality as MySQL Databases menu, in a simplified way though. PostgreSQL Databases: this option allows you to create and manage PostgreSQL databases in cPanel. PostgreSQL Databases Wizard: has the same functionality as PostgreSQL Databases menu, but allows to make all the changes in a simpler way. phpPgAdmin: it is the database management tool, which allows you to make different changes to PostgreSQL databases in your account. MySQL F.A.Q. : this button will take you to the corresponding Knowledgebase section dedicated to MySQL questions. 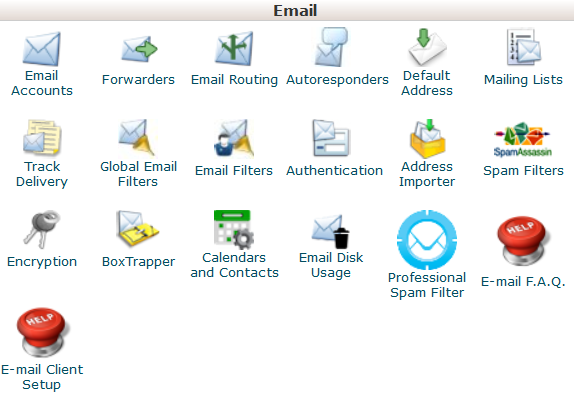 Email Accounts: in this menu you can create and manage mailboxes associated with the domain names hosted in your account. In order to create an email account, feel free to check this guidance. More details about setting up a newly created email account with email clients can be found in the set of articles cPanel Email: Client Setup. Forwarders: setting up Forwarders feature provides you with an opportunity to send a copy of all emails from one email address to another. For example, you have two different email accounts and you don’t want to check both of them every time, so you could forward emails from test@yourdomain.com to test2@yourdomain2.com. Note, that the original address will still receive the forwarded emails. Email Routing: here you can set email routing for the domains hosted in your cPanel account, more details can be found in this guide. Autoresponders: this feature allows you to automatically send messages in reply to incoming emails received on a specific email account. This is pretty useful when you are on holidays or unavailable, or if you have any generic messages to send. You will find more information in this guide. Default Address: in this menu you can manage an email address, which is used by cPanel to fetch any message sent to email accounts which do not exist at your domain (also known as ‘catch-all address’). More details can be found here. Mailing Lists: with this option you can create a single address to send emails, newsletters and other updates to multiple email addresses simultaneously. Feel free to refer to this article to get more information. Track Delivery: this menu allows you to monitor emails delivery for your account. Global Email Filters: this feature allows you to configure filters of all the emails arriving to your hosted domains. Email Filters: with this option you can create filters for each email account for your domain. You can find more details about filtering tools in this article. Authentication: this tool will help you to prevent spam. Setting up DKIM and SPF records for your account equip email messages with verifiable information so that your server can automatically detect the nature of incoming and outgoing messages. The detailed guidance about using this feature can be found here. Address Importer: this menu allows you to use two types of files (.xls and .csv) for importing data in order to simultaneously create multiple email address or email forwarders for your account. Encryption: this option allows you to set up GnuPG, which is a publicly-available encryption scheme that uses the public key approach. This system uses a public key to encrypt messages and you can decrypt them with the private key, which the intended recipient of the message retains. BoxTrapper: this tool can protect your Inbox from spam by requiring all email senders not on your Whitelist reply to a verification email before you can receive their mail. Calendars and Contacts: this menu helps to configure your client to connect to CalDAV for calendars and CardDAV for contacts in order to access them on your personal devices. The detailed instructions can be found in this guidance. Email Disk Usage: this utility allows you to recover disk space by deleting old messages from your mailbox. 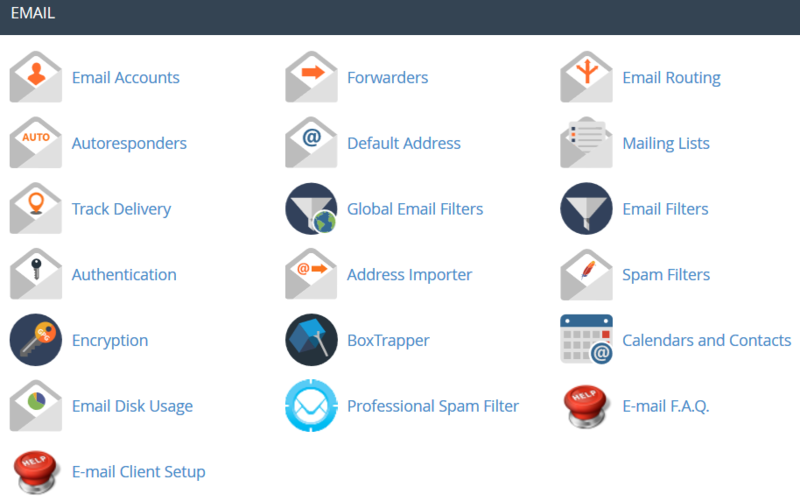 Professional Spam Filter: this menu allows you to configure SpamExperts, a user-friendly email filtering solution that allows to protect your account from both incoming and outgoing spam. More information about this feature is provided in this article. E-mail F.A.Q. : this button will take you to the corresponding Knowledgebase section dedicated to email questions. E-mail Client Setup: this button will take you to the corresponding Knowledgebase section dedicated to email account setup with different email clients and devices. Site Publisher: you can use this interface to quickly create a website from a set of available templates. This allows visitors to see some basic information while you continue to develop your website. Addon Domains: with the help of this menu you can add more domains to the hosting account. Addon domains have the same functionality as the main domain assigned to your hosting account. More details about adding domains to cPanel are provided here. Subdomains: in this menu you can create subdomains and point them to different sections of your website or other IPs. Detailed instructions about this menu can be found in this article. Aliases: this feature allows you to ‘park’ additional domain names to your existing hosting account. They display the same website as your primary domain and share web statistics as well. You can refer to this guide when setting up a new parked domain. Redirects: here you can create a redirect for a specific domain/page to another domain/page and display the contents of the latter. More details can be found here. 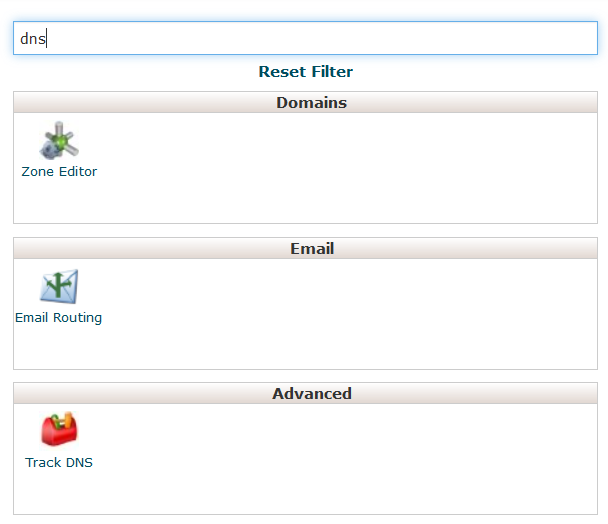 Zone Editor: allows you to edit the DNS zone of the domain(s) in your cPanel account. The following records can be added: A, AAAA, CNAME, SRV, TXT, MX. Feel free to check this article to get more information about setting up DNS records in cPanel. Domains F.A.Q. : this button will take you to the corresponding Knowledgebase section dedicated to domains’ management questions. Visitors: the access log of your account provided in a table view. Errors: here you can check the error log for your account, showing the latest 300 lines of content related to the errors generated by any website hosted in your account. Bandwidth: provides you with the detailed information the bandwidth used by your account. Raw Access: the RAW access log for your account. Awstats: this tool provides you with an opportunity to monitor the access indexes on your account – users, robots, accessed pages and many, many more. You will find a more detailed explanation in this article. CPU and Concurrent Connection Usage: shows information on the resources consumed by your account. You can find some additional information on resource usage in this guide. SSH Access: here you can generate an access key for your account in order to connect using SSH keys. More details about setting up SSH keys can be found in this article. IP Blocker: with the help of this tool you can block a range of IP addresses to prevent them from accessing your site. Feel free to refer to this guide on the matter. SSL/TLS: this tool will help you to install and manage your SSL Certificates. You will find a more detailed guide here. Hotlink Protection: in this menu you can enable hotlink protection for your website (that is to prevent someone from direct linking of your images to another website and, as a result, consuming your hosting account bandwidth). Feel free to check this guidance for additional information. Leech Protection: allows you to control whether users can give out or publicly post their passwords for restricted areas of your site. It can be used to redirect compromised accounts to the URL of your choice, or suspend them. SSL/TLS Status: use this interface to view the SSL status of your domains. Two-Factor Authentication: this tool lets you enable 2FA, an improved security measure that requires two forms of identification: your password and a generated security code. When 2FA is enabled, an app on your smartphone supplies a code you must enter with your password to log in. You can learn more about enabling 2FA here. PHP PEAR Packages: this options allows you to install and maintain PHP PEAR packages for your hosting account. Perl Modules: here you can manage Perl modules available for your account. A Perl module is a discrete component of software for the Perl programming language. Perl is supported on all of our shared/reseller servers. This article will provide you with more details about this feature. RubyGems: in this menu you will find the set of functions that allow you to perform tasks in Ruby. It’s needed to install a Gem before you can use it inside a Ruby program. Ruby on Rails: with this menu you can use Ruby on Rails features. Ruby on Rails is a free web application framework for the Ruby programming language. It is often referred to as ‘Rails’ or ‘RoR’. We support RoR with our Stellar Plus, Stellar Business and Reseller packages (and old Professional, Ultimate, Business SSD, Reseller packages). The following versions are working on our servers: Ruby – 1.8.7, Rails – 2.3.18. More information can be found in this guide. Optimize Website: this feature allows you to enable/disable and configure the compression of your website by tweaking the way Apache handles requests, which can increase the performance of your website. Select PHP Version: here you can change PHP version applied to your cPanel account. You can find more information in this article. PHP F.A.Q. : this button will take you to our Knowledgebase site section dedicated to PHP-related questions. Cron Jobs: here you can set up scripts running on a scheduled basis. For more details about setting up CronJobs refer to this guidance. Track DNS: using this tool you can check DNS information about any domain, or to trace the route from the server your site is on to the computer you are accessing cPanel from. 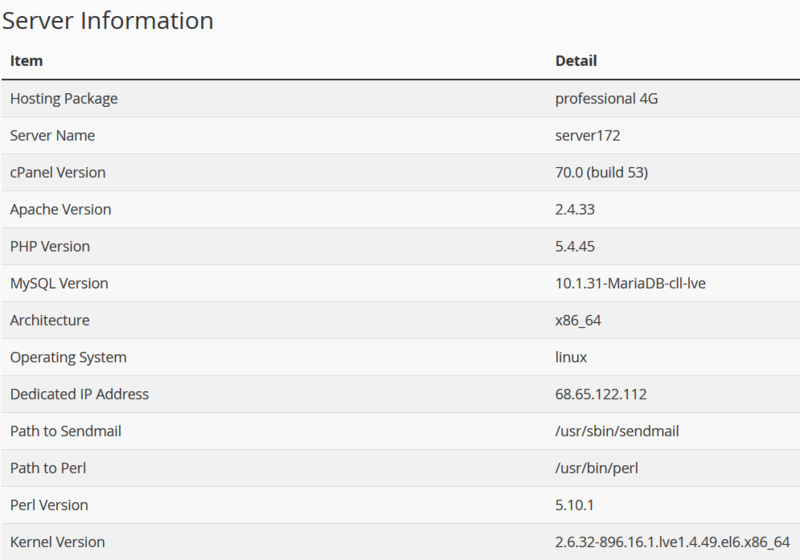 Indexes: in this menu you can customize the way in which visitors can view a directory on the web. Error Pages: this feature allows you to edit the code for the default errors pages your website can display. Apache Handlers: here you can configure different Apache handlers for dealing with certain file formats. MIME Types: provides you with the information about the system predefined MIME types and the option to add a MIME Type on your own. Virus Scanner: this tool will allow you to scan your account for viruses with ClamAV virus scanner. ClamAV is an open source (GPL) anti-virus engine used in a variety of situations including email scanning, web scanning, and end point security. It provides a number of utilities including a flexible and scalable multi-threaded daemon, a command line scanner and an advanced tool for automatic database updates. Password and Security: this menu allows you to change your cPanel main password if know the original one. Otherwise, you can reset the password following the steps in this guide. Change Language: this feature provides you with an opportunity to change your cPanel interface language. Change style: here you can change the overall look and feel of the interface by selecting one of the several preinstalled styles. Contact Information: in this menu you can specify an email address that will receive system email notifications. User Manager: allows you to manage your Subaccounts. Subaccounts use the same login and password information for email, FTP, and Web Disk. 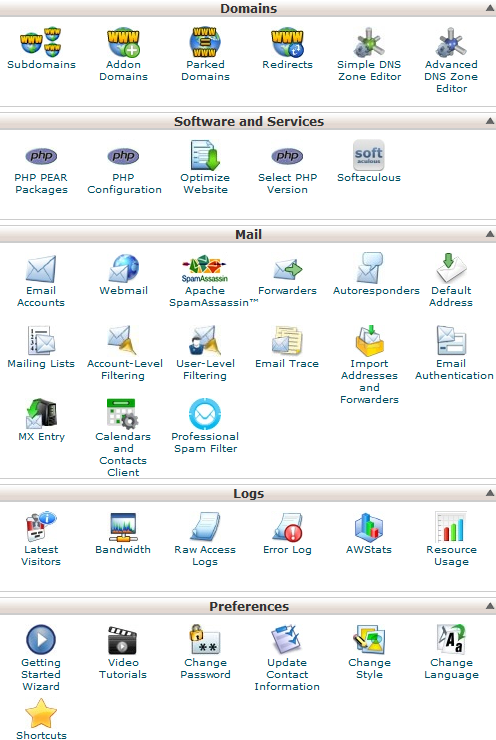 Left column which includes different Stats information about the account, the possibility to switch cPanel theme, the search bar and frequently accessed menus and Right column which provides a number of various features that are conveniently structured to specific groups based on the concrete aspect of the web hosting service. Main Domain: the primary domain name associated with your hosting account. Home Directory: the path the home directory of your account on the server where your websites’ folders and files reside. Last Login: the last IP address your cPanel has been accessed from. 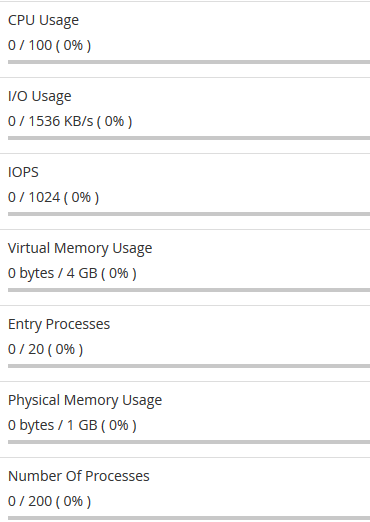 Disk Usage: the amount of server disk space provided with your cPanel account. This index displays disk space used by your websites’ content, databases, emails, etc. File Usage: the current number of files (inodes) and your cPanel account’s inode limit. Addon Domains: the current number of already added addon domains and the total number allowed for your cPanel account. 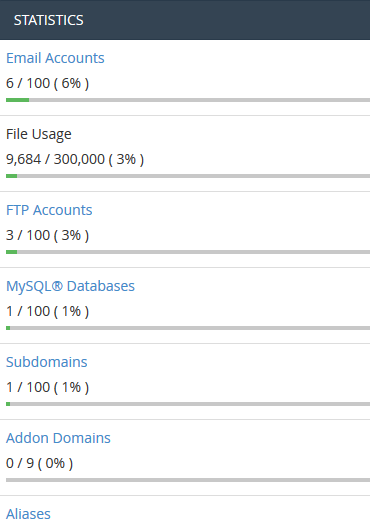 MySQL Databases: the current number of MySQL or MariaDB databases created your cPanel account. Subdomains: the current number of already created subdomains and the total number allowed for your cPanel account. Email Accounts: the current number of already created email accounts and the total number of email accounts allowed for your cPanel account. FTP Accounts: the current number of already created FTP accounts and the total number allowed for your cPanel account. MySQL Disk Usage: the amount of disk space used by your MySQL or MariaDB databases. PostgreSQL Disk Usage: the amount of disk space used by your PostgreSQL databases. Bandwidth: the current amount of data transferred to and from your cPanel account for the month and the total amount of your cPanel account’s monthly bandwidth limit. Aliases: the current number of already created alias domains and the total number allowed for your cPanel account. Mailing Lists: the current number of already created mailing lists and the total number allowed for your cPanel account. Autoresponders: the current number of created email autoresponders and the maximum number allowed. Forwarders: the amount of email forwarders created and the maximum number allowed. Email filters: the number of email filters created vs. the maximum number allowed. PostgreSQL Databases: the current number of PostgreSQL databases created in your cPanel account. CPU Usage: this value specifies how much of the allocated CPU resources you are currently using. The amount of CPU resources we provide to each account is the percentage of the server’s resources. Entry Processes: this is the number of processes that enter your account. For example, every PHP page that is accessed by a user will usually generate a single entry process. Physical Memory Usage: the actual memory allocated for your account. Virtual memory is usually a file on a disk drive that the operating system uses to store information (swap-to-from) when the real memory becomes full, for instance the page (swap) file on a Linux system. Therefore, if you try to publish a big post, it might take all physical memory to do so, but after some time it will be normalized. I/O Usage: this index represents how much I/O (or disk activity) your account is using. Any task which makes use of the servers disk drive (such as reading or writing to the server) will consume I/O. More details about resource limits can be found here. Number of Processes: this limit is similar to the above but includes all the processes generated by the account rather than the specific PHP, SSH or cron jobs. This group of features provides you with the general information on cPanel management and allows you to make basic changes to your cPanel account. Password & Security: this menu allows you to change your cPanel main password if know the original one. Otherwise, you can reset the password following the steps in this guide. This group of features allows you to create email accounts for your domain names and manage email settings. 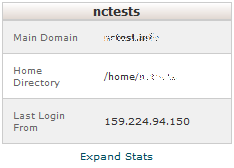 Zone Editor: allows you to edit the DNS zone of the domain(s) in your cPanel account. The following records can be added: A record, AAAA record, CNAME record, SRV record, TXT record. Feel free to check this article to get more information about setting up DNS records in cPanel. CPU and Concurrent Connection Usage: shows information on the resources consumed by your account. phpMyAdmin: the database management tool, which allows you to make different changes to MySQL databases in your account. You can find more information about how to work with databases via phpMyAdmin this guide. MySQL Databases: in this menu you can create and manage MySQL databases in cPanel account. MySQL Databases Wizard: provides the same functionality as MySQL Databases menu, in a simplified way though. More details about how to use both menus can be found here. phpPgAdmin: the database management tool, which allows you to make different changes to PostgreSQL databases in your account. Virus Scanner: this tool will allow you to scan your account for viruses with ClamAV virus scanner. ClamAV is an open source (GPL) anti-virus engine used in a variety of situations including email scanning, web scanning, and endpoint security. It provides a number of utilities including a flexible and scalable multi-threaded daemon, a command line scanner and an advanced tool for automatic database updates.